My review: Kenyon's wildly popular paranormal series has a firm foundation rooted in Greek and Roman mythology, from which she expands upon to create her own intricate supernatural universe. Dark hunters are ancient warriors with their own individual, albeit sad, beginnings that usually plays heavily on the way they die. Each tale reveals their painful history, their opportunity to become one of Artemis' hunters, and their redemption comes in the form of of a loving woman. Formulaic, yes, but Kenyon expands upon this by penning engaging characters--some of which are unforgettable--and placing them in dynamic situations. The past clashes with the present, other races with names like Daimons and Apollites provide conflict, and each featured hunter has a cool ability which aids him in his battles (which are fought alongside his friends and their awesome cache of clothing and weapons). After nineteen books I will honestly admit there is just so much of Acheron, Artemis and Simi's machinations I can take without growing tired. Some books have been wonderful, others good. Still in all I began to believe around book fifteen, that this series could use another infusion of something. That infusion is here. In Retribution Kenyon has successfully added to her richly imagined worlds by incorporating Native American Gods, folklore and mythology. I'm aware other fans don't like this addition. That's alright. After tearing through it in one night, I welcome it. Cowboy Jess lives in Las Vegas and his latest assignment is to get the one responsible for killing off other dark-hunters. But things drastically change when this 'killer' mistakenly murders one of the four Guardians and sets off the beginning of the apocalypse. When Jess meets and subdues the assassin, he is surprised to learn this killing machine is a woman from his past named Abigail. Jess suspects there is more to her story than her tough exterior. If only he can get close enough to her to find out. When his comrades want to kill her, Jess is the only one who wants to keep Abigail alive. While different levels of the apocalypse occur, Jess has to figure out who has mislead Abigail while he controls his growing feelings for her. I liked Jess and the concept that he was different--a cowboy with a sordid past who was changed by the love of a good woman--but he was betrayed and now lives a solitary existence. He was a laid back, easy going man with conviction and beliefs. Abigail became a one woman army hellbent on exacting revenge on the one who killed her parents. She believes that man is Jess. Her character took a while to warm up to and that was done on purpose. As a trained killer, she was deceived by the ones who professed to care for her. I liked watching Abigail's gradual transformation, hearing her inner arguments, seeing her hesitancy to succumb to her feelings. As these two give in their mutual attraction, the romance blossomed but not as much as in other DH novels--there was an apocalypse to deal with--and while handling this was the one scene I felt was unrealistic: the romantic scene inside the car wash. With nasty creatures raging outside the building, they took this moment to talk and get cozy? (OK, even figuring on their thinking this is the end so why not just go for it, like I said, they're both trained fighters with an apocalypse going on?) otherwise, there was a lot of intense action, some cool fights, and a battle down a canyon involving a tractor trailer cab. What really stood out for me in Retribution was the Native American characters, their folklore, legends and creatures woven into the storyline. From the four Guardians, the mysticism and spirituality aspects, reincarnation, creepy new monsters, and the introduction of Choo Ca La Tah (the Guardian of the North with an English accent), I became thoroughly fascinated in the story. I was glad Kenyon included an Author's Note fully explaining her reasons for writing this book the way she did. I hope Jess' friend Ren will have his very own story soon. Retribution may be number twenty in a long list of entertaining books and for this fan it symbolizes a new direction with its fresh ideologies. 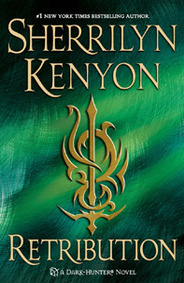 I wonder what Kenyon has in store for us with book #21? Favorite excerpt: "He flashed a fanged grin at her. "I might have lost some skin, but I got kissed by a beautiful woman who was happy to see me. I gotta say that's pretty epic in my book. Definitely not a worst-case day here." Given what she'd seen of his past, she knew that for a fact. Still . . . Being you. Things she couldn't say out loud without embarrassing herself to the deepest level. But she felt that gratitude so much that it made tears prick at her eyes. "You okay?""